How can Thomas Crapper and Mickey Mouse help resolve the conflicts in Iraq and North Korea better than the entire U.S. Administration? And, who the heck is Thomas Crapper? Find out how these two forces, well deployed, can change the outlook of two nations and the world. They have already, and can again. They are both Sentinels of Vigilance. GROUND ZERO, New York City, Jan. 13-Two fascinating events occurred on this date. Both offer solutions to our challenges with Terrorism. The first was the introduction of the Mickey Mouse comic strip in 1930, the second, the 1863 introduction of the one-piece pedestal flushing toilet by Thomas Crapper. 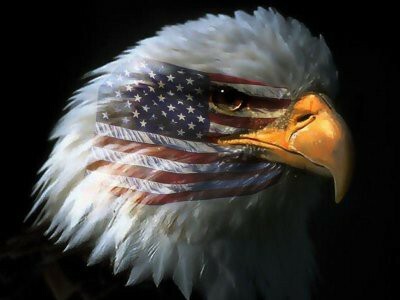 Both were acts of Vigilance that can, if employed, help reduce the threats of Terrorism in Iraq and North Korea. Let's look first at the Mickey Mouse Vigilance Solution. In a world of Terrorism it seems a new threat appears on the horizon each day that endangers the security of the Children's Children's Children. The turmoil leaves few safe havens. But there is hope. One of those hopeful safe havens is Disneyland, a magical kingdom where both parent and child transform into one, and where illusion becomes reality, where the Trinity of Vigilance's Courage, Conviction and Right Actions sweep away the Triad of Terrorism's Fear, Intimidation and Complacency. When one enters Disneyland it is usually through an archway where a sign trumpets that one is leaving one world for another--the world of coarse reality for the world of beautiful illusion. Whatever ills or problems one has, or is afflicted by, must be checked at the archway--at least mentally. Upon entering the Magic Kingdom parents, children and loved ones find respite in a world where everything is safe and secure, where there is no abuse or hunger, poverty, no Fear, Intimidation or Complacency. It is a world that fires the imagination, one that banishes the Beast of Terror. For over three decades I lived in Orange County, California. Disneyland was about a twenty-minute drive away, just up Interstate 5. Whenever I wanted to feel good, I'd go to Disneyland. I'd make up an excuse to take the kids, but the trip was for me, to let my child, my "little guy inside" revel in the joys of fantasy and illusion. Disneyland is a world constructed totally by adults to free a child of all the Fears, Intimidations and Complacencies of the "outer world," and, by default, to salve the souls of the children's parents, loved ones and guardians who brought the children to the park. The engineers who built it squatted down when they designed Main Street so that the vision they produced would appeal not to an adult's eye-level, but rather to the eye-level of a child. Everything was geared to open the child's mind to the magic of imagination--the "what-can-be's" versus the "what is's"
I remember reading about the history of Disneyland. When Walt Disney told his wife, Lilly, he was going to build an amusement park she turned up her nose at the idea and said, "But Walt, amusement parks are dirty." He reportedly looked at her and smiled: "Mine will be the cleanest in the world." True to his word, each night the streets of Disneyland are steam cleaned. Almost before a piece of litter hits the ground, one of the hundreds of maintenance crews rush to pick it up, burying it out of sight in a Hefty bag. Cleanliness is one of Disneyland's key to joy and happiness. 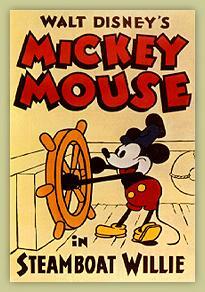 Mickey Mouse, who made his film debut in 1928 in "Steamboat Willie," is the official greeter and logo of Disneyland. Each year over 50 million people pass through Disneyland's Enchanted Gates in Tokyo, Florida, Anaheim and Paris. Over a decade, nearly one percent of the entire world's population visit the Magic Kingdom. In 2005 another Disneyworld is scheduled to open in Hong Kong. If there is a United Nations for families, it exists at Disneyland. There is no more symbolic arena of what the world should be like for the children and great great grandchildren of the future than at one of the Disneyworld theme parks. Inside the Magic Kingdoms colors of skin, politics, religious differences and economic diversity melt away. 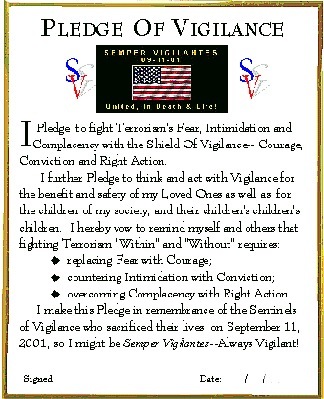 Parents, grandparents, relatives and loved ones all become Sentinels of Vigilance. The children's serenity, not the greeds and desires of the adults, dominates the agenda. If all the world were to meet at Disneyland, odds are a mandate for stopping war and strife would result. The future of the children would be the focus of all decisions. Nearly seven decades ago, the world leaders recognized the power of Mickey Mouse and the Disney approach to unifying the differences of human beings through children. 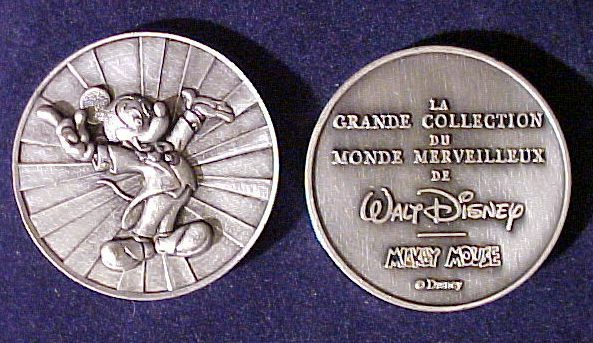 In 1935 the recently formed League of Nations, which would ultimately morph into the United Nations, awarded Mickey Mouse a special medal. It was a "symbol of goodwill," a notation by the world leaders of the time that the power imagination trumpets over Terrorism of all degrees. 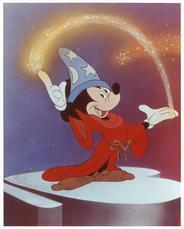 But in the ensuing years, it seems we have forgotten to hold up Mickey Mouse as a symbol of World Vigilance. If we reinstated him as the Children's Sentinel of Vigilance, we might make more progress than we have toward unifying all nations to the common goal of protecting the Children's Children's Children from the Beast of Terror. Today, it would seem quite appropriate for the United Nations to consider a mandate that a Disneyland theme park be built in both Iraq and North Korea. The cost of such an enterprise would be far less than the cost of war, and the impact far more enriching for the people of both nations. Mickey Mouse would make a great sidekick for Colin Powell. Equally important in helping bring Terrorism to its knees is the invention of Thomas Crapper, introduced 140 years ago. Modern technology has brought us many things of value in the world, but none more important than that which Mr. Crapper invented--the flushing pedestal indoor toilet. Over the past fourteen decades, a vast number of human beings haven't been Terrorized by having to rush to a primitive privy. Instead, they can casually enjoy morning constitutions without the uncivilized "outdoor" commodity--the one or two-holer positioned outside their home where cold wind whips through the cracks of warped wood and one has to hold his or her breath to survive the experience. I have deep personal knowledge that Thomas Crapper's invention can change one's outlook from Terrorism to Vigilance. When I was in Vietnam, I lived on the front lines. We used primitive outhouses. There was, of course, no flushing water, just a wooden structure with a 50-gallon barrel located under a wooden seat. It was a primitive way to perform your toilet duties, and, a reminder of primal Terrorism. You constantly had to check for bamboo vipers and spiders before you sat down, plus, there was always the threat of a sniper picking you off. You were truly a "sitting target." As a warrior, I didn't expect anything more than the primitive toilet. U.S. Marines are trained to be tough and rough, but there is a limit. I lusted for a Thomas Crapper invention. My morning constitutions set my day, and the more troubled they are, the more I grit my teeth the rest of the day. And, I don't think I'm alone in this area. I am convinced the more one lives in a Terrorist environment, the more Terroristic one thinks. Families who live in poverty, who are deprived cleanliness and conveniences, tend to be full of angst, anger at their surroundings. It is hardly likely a child who lives in depravation of human basic sanitation can grow up with a smile on his or her face. War creates such poverty. It often keeps populations restrained in ancient habits, denying civilized advancement because the nations waste funds that could be used to build the standard of living. North Korea, for example, spends over 50 percent of its total national budget on military expenditures. In comparison, South Korea spends 4.4 percent. The recent famine in North Korea that caused the death of more the 2 million of its citizens, is often attributed to a misappropriation of funds from the people to the government. A diversion of dollars from feeding the military machine to building the infrastructure of the nation would go a long way toward paving the road to peace. For example, if the citizens of North Korea had access to their own Disneyland, and each household had a flushing toilet, the odds are the citizens wouldn't stand for a government that took half their money and put into building the fourth largest army in the world, or insisted on risking their by provoking war to build nuclear weapons. Ironically, a flushing toilet in every household in North Korea could be the straw that breaks Kim Jong Il's warlord back. Thomas Crapper helped me want to end the war in Vietnam. After being deprived of a flushing toilet for months, I went on a search for one. I scoured the area near my outpost and found nothing. So I extended my range farther and farther until I ended up scouting out the First Marine Division Headquarters in Chu Lai. There I found my prize--an old French officers billet. Driven from South Vietnam in 1954, the French left certain marks on the country. One of them was a beautiful, flushing toilet. Inside the billet I found behind a supply depot at Division Headquarters was a beautiful tiled "throne." You took two steps up the tile and there atop it was a magnificent toilet. It gleamed like a jewel as shafts of South East Asian sunlight splashed off the gleaming porcelain. The toilet seat was made of rich, heavy oak. A long water pipe speared up behind the throne toward a water tower atop the building. Bolted on wall three feet above the "throne" was a porcelain water container. A brass chain hung down with an oak handle near the toilet so that when you were finished you simply pulled the chain and down flushed gallons of water that swooshed the waste away in a loud, growl that sounded like a symphony orchestra climaxing a masterful performance..
Once a week I made up some excuse to commandeer a jeep, drive through hostile enemy territory, braving snipers who liked to sneak along the narrow roads and take pot shots at Marines, and raced to the French toilet I discovered. I told no one about it. It was my very very very private secret. There, with the sunlight shafting through the windows, the oak seat snug against me, I was king of my own domain. I was safe from the bamboo vipers and spiders and snipers who liked to take pot shots at Marines sitting on the outdoor toilet. War was a far-distant thought. Peace and serenity consumed me. 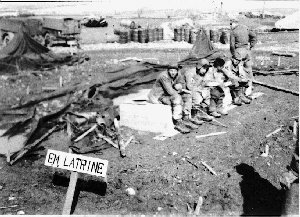 While some may scoff at this anti-war toilet-link, it is only because they haven't lived like an animal, ate like an animal, or fought like an animal. The civilized part of me--the Vigilant part--intuitively knew that I must keep some connection with civilization or I might be consumed by the Beast of Terror's desire I become nothing more than an animal, forgetful that war's purpose is to make room for the evolution of Vigilance by ridding the world of Terrorism. I knew Terrorism suppressed evolution. The more primitive the way of life of a people, the more vulnerable they were to despots. The greater the distance between the "haves" and "have nots" the more chance of swaying the people to think they didn't deserve such things as a flushing toilet or a Disneyland. Terrorists like to keep their children in a constant state of Fear, Intimidation and Complacency so they can dominate them. A child abuser exercises power over his or her prey--the child--making the child dependent, a slave to the whim of the abuser. The abuser robs the child of dignity, of the right to evolve into his or her own person. In despotic, tyrannical nations, such leaders treat their people as subjects, tools of their personal glorification. They deny the masses the right to individuality, to freedoms enjoyed by other democratic nations. They like to keep the money from a nation in their pocket, under their control, and there is no easier and more efficient way to control a nation than to have a military force that is well paid and well armed to serve as the despotic leaders' personal body guard, who will do what they are told even if it means the continued enslavement in poverty of their own people. Offering every person in such a society a flushing toilet would violate a despot's rule of leadership through Intimidation. It would start a revolution among the people for other conveniences, other benefits that would eventually rob the despot's treasury. In my opinion, every evolving human being in every developing nation should have a flushing toilet. And, every family member should have access to their "national" Disneyland for their children, and grandchildren. If all nations had these two powerful assets, Terrorism would be on the run. So, on this day, January 13, we might all have lots of opinions about resolving the impending war in Iraq, or easing the tensions in North Korea. My suggestions are basic, perhaps primitive, but they have value. One, we should all salute Thomas Crapper. Our Administration, rather than trying to negotiate with Kim Jong Il or Saddam Hussein, should go right to the source and put flushing toilets in every home in North Korea and Iraq. The toilets should be prominently marked with the slogan: "Made In The USA!" The second suggestion as mentioned above to rid these nations of Terror Control is to build a Disneyworld in Iraq and North Korea. Call them VigilanceWorld. Let Mickey Mouse be the Ambassador of Vigilance. After all, sixty-eight years ago the League of Nations recognized him as a Sentinel of Vigilance and gave him a medal as a symbol of goodwill. Why not put that symbol into action? Why not let Mickey do the regime changing? Flushing toilets and Mickey Mouse will drive the Beast of Terror into the wastelands faster than bombs, bullets and sword rattling. I think the Sentinels of Vigilance would agree, don't you? 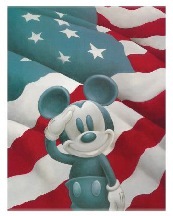 If you think this idea has merit, make Mickey smile--take the Pledge of Vigilance. And, the next time you flush your toilet, thank a guy named Thomas Crapper.